We spent the last couple of days counting and organizing books at Cambridge. This gave us a chance to check all the books were in packs, the packs were labelled correctly, and CDs etc. were in the right place. 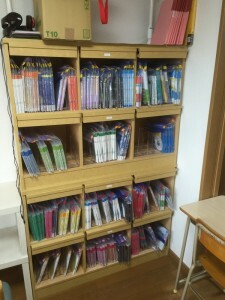 We also had a chance to reorganize our shelves to make classes run a bit more smoothly. The lower levels (YL 0.1-1.0) consist mainly of sets. 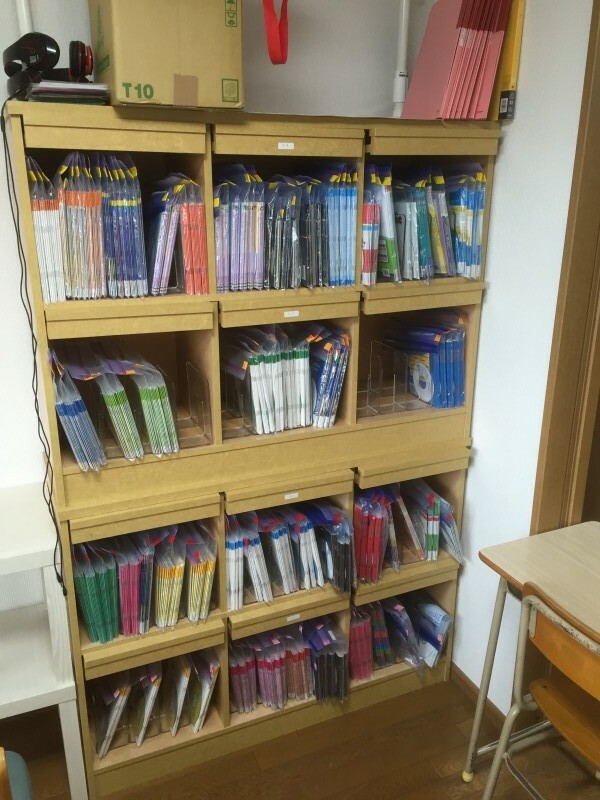 We have 1-6 of each set of core books, and mostly one or two sets for supplementary books (see this post for more detail about core and supplementary). My experience with ER is that libraries are never finished, and it always feels like there aren’t enough books. At the moment the Cambridge library is adequate for our needs (around 60 student in the Academy program, along with about ten who are just borrowing books) but as students move into the intermediate level (YL 1.1+) we’re going to feel the pinch. We’re also lacking at the advanced level. So another year or two of book buying on the horizon. This is one reason I am not too worried about competition in this space. In order to create a similar program, a competitor would need the know-how, millions of yen, and the confidence/desire to make it work. 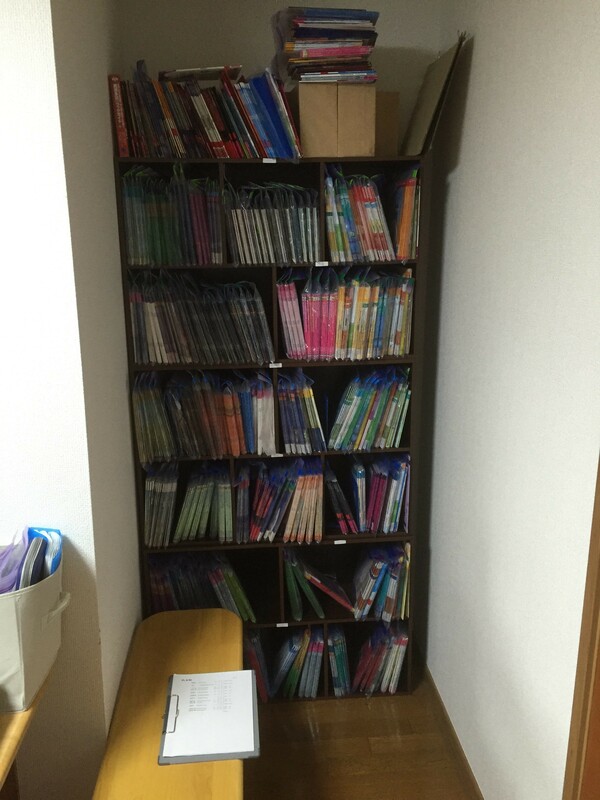 Our current collection, assembled over the last 13 years, is probably worth well over 3 million yen and we are still ploughing back a big chunk of revenue into books. Even if someone did manage to create a competitor program in our area, I think there are enough students in Sendai to go around. I’ll be writing a post about how to start from scratch next, so don’t be discouraged if you don’t have any books or budget right now. I wonder about the upper levels. You have to see how long your students stay with the program. I would think that some would take off reading pretty much anything before they need the upper levels, and others will drop out before they get there. That said, you have an impressive number of books already. Our library is just for volunteers who want to do more than the class work. Only a few students really read all of the books, and they usually have a parent supporting them by helping them set individual goals. We only have 1000 books total. It is enough to get them started, but I dream of a time when I can build more into the library and make library usage from some age part of the curriculum. Not sure how to go about that yet. Yeah, we’re really lacking in higher level books. On the other hand, we only have a couple of students in the intermediate level (YL 1.1+) so I figure we can ramp up as of when we need to. The collection will change a lot once we have 2, 3, 4, 5, and 6 year students in the program. Until now the longest has been about eleven months. Looking forward to seeing what our current JHS 1st years are going to be like when they hit university!